Mother and daughter team Carole and Serena, serial developers with a proven track record, approached Rob at Castle Ring Oak Frame for help with their latest project near the West Midlands town of Bewdley. Essentially a 3 bay, 3 bedroom dwelling which had to incorporate and preserve the remaining listed elements of an existing barn – namely a stone dwarf wall and a precariously leaning half timbered gable wall. Kidderminster architects had drawn up the plans and taken the project through the planning process, all Carole and Serena had to do now was find a timber framer and builder to make things happen on site. After a site visit and careful survey, Castle Ring Oak Frame came up with a design which sat the frame within the existing walls, enclosed by a SIPS insulated “overcoat” of walls and roof. The troublesome half timbered gable would remain technically on the outside of the frame/sips construction and would be weatherboarded (at the request of the conservation officer). Preserved for ever but hidden from view! Rob collaborated on the design with SIPS suppliers SIPS Eco Panels so that the building envelope would fit and could be attached as soon as the frame had been erected. 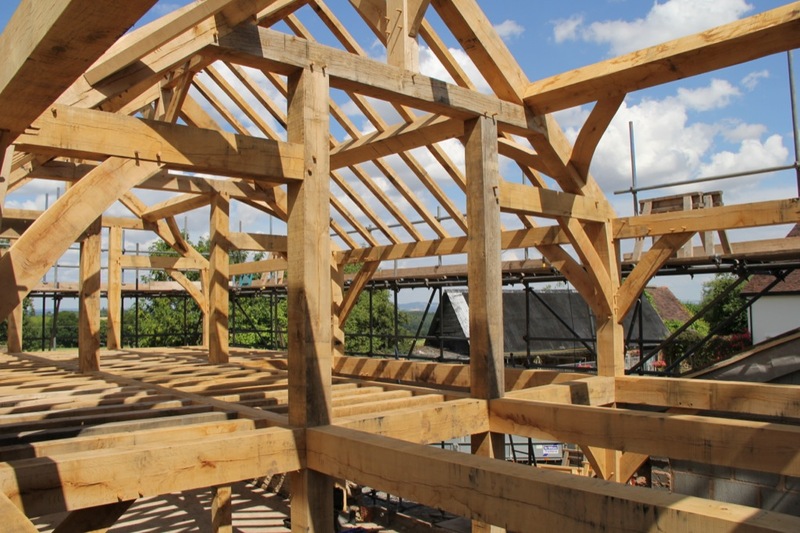 One of the many advantages of attaching a SIPS system to the outside of an oak frame is that the oak frame can be seen in its entirety internally. The frame itself comprises a heavy oak joisted floor, interrupted tie-beam trusses, fully jowled posts, purlins with curved wind bracing and a braced ridge beam. The SIPS roof panels span from the wallplate, over the central purlin to the ridge. Rob and his team erected the whole frame on one gloriously sunny day. Within another couple of weeks the building had an insulated and waterproof shell enabling Carole and Serena to progress the rest of the build.